"All the Light We Cannot See" by Anthony Doerr will be discussed. Listeners and participants welcome. "The Invention of Wings" by Sue Monk Kidd will be discussed. Participants and listeners welcome. For all ages. Part of Ephraim's Christmas in the Village celebration. Readers' choice in the category of "Nature Writing." Participants and listeners welcome. Call for more information. Book Discussion of “American Dervish,” led by Becca Berger, Door County Library Director. "Me Before You" by Jojo Moyes will be discussed. Listeners and participants welcome. "Being Mortal" by Atul Gawande will be discussed. Participants and listeners welcome. "Van Gogh: A Power Seething" by Julian Bell will be discussed. Participants and listeners welcome. A planning meeting to decide on the winter 2016/spring 2017 books choices. Participants should bring book suggestions. Gently used books for all ages will be available. Proceeds benefit Ephraim Library. Planning meeting for 2017. There is no reading theme planned, so come with a variety of book suggestions. Kids can bring their favorite book (or find one at the library) and read to a friendly, patient therapy dog named Nellie Bly. "The Sympathizer: A Novel" by Viet Thanh Nguyen. Participants and listeners are welcome to the discussion of this recent Pulitzer Prize winner for Fiction. "The Painting" by Nina Schuyler. Participants and listeners are welcome to the discussion of this recent Pulitzer Prize winner for Fiction. Genre: Young Adult; pick your own fiction or nonfiction book. Participants and listeners are welcome to the discussion. Book Discussion of "Empire Falls" by Richard Russo. "Tribe" by Sebastian Junger. Participants and listeners are welcome to the discussion of this recent Pulitzer Prize winner for Fiction. "Behold the Dreamers" by Imbolo Mbue. Participants and listeners are welcome to the discussion of this recent Pulitzer Prize winner for Fiction. Book club members gather to discuss short readings such as magazine, newspaper, or online articles and book chapters of interest. For more information contact Mary 920.854.2014. "Indian Givers" by Jack Weatherford and planning meeting (bring your book suggestions). Participants and listeners are welcome to the discussion of this recent Pulitzer Prize winner for Fiction. Gently used books for all ages available for sale. Proceeds benefit the Ephraim Library. Kids are invited to read aloud to Nellie Bly, a friendly dog who loves to listen. Bring your own book or find one at the library. Book club members gather to discuss "Foreign Bodies" by Cynthia Ozick. Participants and listeners welcome. Kids are invited to read aloud to Nellie Bly, a friendly therapy dog who loves to listen. Bring your own book or find one at the library. Book club members gather to discuss "The Sense of an Ending" by Julian Barnes. Participants and listeners welcome. For more information contact Mary 920.854.2014. Book club members gather to discuss “The World We Found” by Thrity Umrigar. Participants and listeners welcome. For more information contact Mary 920.854.2014. Book club members gather to discuss “The Underground Railroad” by Colson Whitehead. Participants and listeners welcome. For more information contact Mary 920.854.2014. Book club members gather to discuss “The Perfect Horse” by Elizabeth Letts. Participants and listeners welcome. For more information contact Mary 920.854.2014. Featuring a storytime, sing-a-long, holiday activities, and cookies for kids and adults. Discussing "News of the World" by Paulette Jiles. For more information and questions call Mary at 920.854.2014. 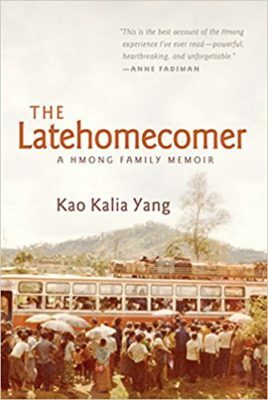 Discussing Door County Reads 2018 selection, “The Latehomecomer: A Hmong Family Memoir” by Kao Kalia Yang. “Pick Your President.” Read a bio of a U.S. President of your choice or historical survey of multiple presidents. All welcome. Discussing "Thank You for Being Late" by Thomas Friedman. All welcome. Topic: "Pick a Classic." Held in conjunction with Gibraltar High School AP English Class, who are reading "The Scarlet Letter." Refreshments provided. All welcome. Meet-and-greet Library Director, Tina Kakuske, while enjoying treats and find out about upcoming events at the library. Stop in for coffee and conversation. Tell us about what you’re reading or listening to: bring a book, article or podcast to share. Refreshments provided. Discussing “Another Brooklyn” by Jacqueline Woodson. Refreshments provided. All welcome. Discussing “A Gentleman in Moscow” by Amor Towles. Refreshments provided. All welcome. Pick up a few books, audiobooks, movies and more and grab some home-baked goods (8am-12pm). Sales support the Ephraim Library. "The Underground Railroad" by Colson Whitehead. Refreshments provided. "Door County Lighthouse Rock" with special guests author, Sue Jarosh, and drummer, Paul Wanish. Stories and snacks. For ages 4-10. Space is limited. Pre-registration recommend by calling 920.854.9688. "Tuck Everlasting" by Natalie Babbitt. Refreshments provided. Bring a chair, a lunch, and enjoy the free concert. Featuring author Lan Samantha Chang and poet Nan Cohen. Discussing "Ordinary Grace" by William Kent Krueger. Participants and listeners welcome. Refreshments provided. Discussing “Pachinko” by Min Jin Lee. Participants and listeners welcome. Refreshments provided. Discussing “Jayber Crow” by Wendell Berry. Participants and listeners welcome. Refreshments provided. For kids. Try the new 3D printer and enjoy a story and snack. Enjoy a story time, craft, and snack. While there, guess the number of books in the Book Christmas Tree. “Pick Your Own Essay Collection.” Bring something that you're reading to talk about. Participants and listeners welcome. Refreshments provided. Discussing "Educated" by Tara Westover. Participants and listeners welcome. Refreshments provided. Discussing "Little Fires Everywhere" by Celeste Ng. Refreshments provided. Participants and listeners welcome. "Plastics in the Great Lakes." Where does it come from and what can we do about it? We'll read a little, explore the science and brainstorm an action plan. Presented by Anne Moser, senior special librarian from the UW-Madison Wisconsin Water Library. Part of Door County Reads 2019. Discussing "Wintering" by Peter Geye and "The Death and Life of the Great Lakes" by Dan Egan, both selections of the 2019 Door County Reads. Participants and listeners welcome. Discussing "The Girl with Seven Names" by Lee Hyeonseo. Participants and listeners welcome. Discussing "The Hate U Give" by Angie Thomas. Participants and listeners welcome. Discussing "The Rent Collector" by Camron Wright. Participants and listeners welcome. Discussing "Enigma of China" by Qiu Xiaolong. Participants and listeners welcome.